The A10 Tauern motorway is one of the most important north-south connections across the Alps, traversing Austria on a length of almost 200 km. It leads across a myriad of bridges that hardly differ from one another and thus are barely noticed. They fulfil their purpose reliably, crossing and spanning rivers and valleys and hugging the steep slopes for kilometres on end. 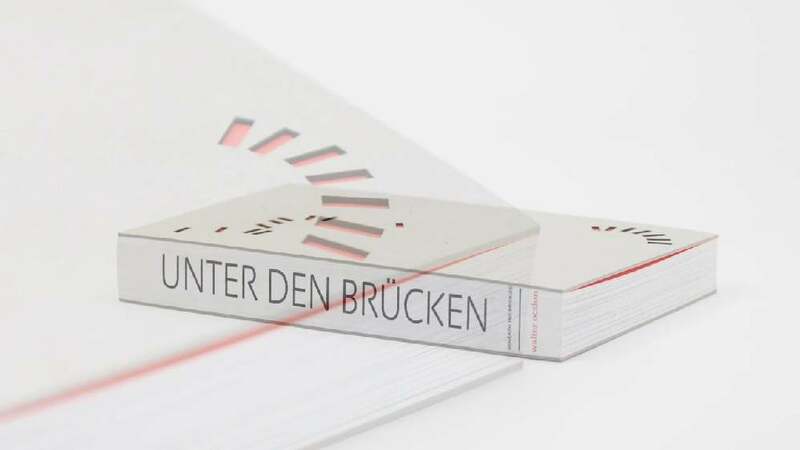 The book “Unter den Brücken” (Beneath the Bridges) focuses on these bridges and the interspersed gaps they create, staging them almost like graphical elements within a landscape scenery or as massive constructions reigning over often silent and placid spaces beneath. Breathtaking photographs shot from unusual, even astonishing angles, setting a monument to these massive yet purely functional constructions. They exude a tranquillity that forms a stark contrast to the massive, loud and anonymous subject matter of reinforced concrete. The thick, sturdy paper and the book cover made of plain cardboard with punches forming orange rectangles, which signify bridge abutments, provide the tactile equivalent to the attractively edited subject matter. The design of this book succeeds in visually implementing its topic in an outstanding manner. In terms of typography and form, above all, the story is realised with extraordinary stringency. Even the grey, plain cardboard cover resembles a bridge pillar, while the outstanding photographs reflect the predominance of vertical forms. Form and content have merged into a highly sophisticated whole.